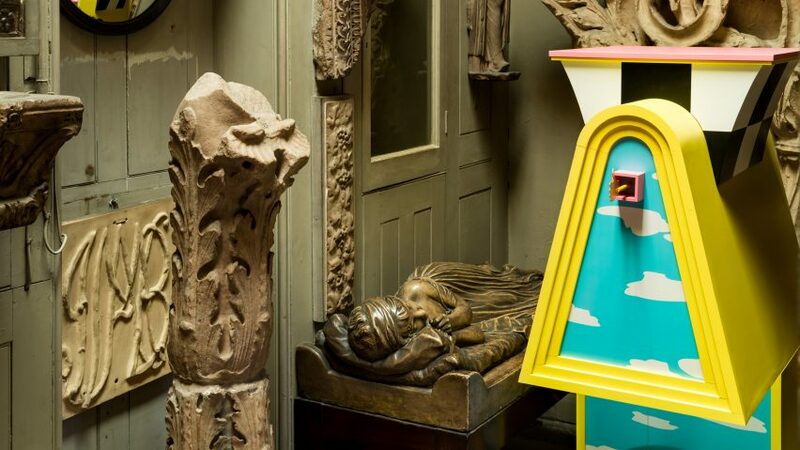 There are four colourful new sculptures inside Sir John Soane's Museum in London, designed by architecture office Studio Mutt to represent a lawyer, an architect, a monk and a magician. 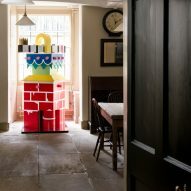 Called Out of Character, the project sees the four mixed-media installations set up in different rooms of the house museum, which was the home of neoclassical architect John Soane in the 19th century. They were unveiled on 15 September, during London Design Festival, and will remain in place until 18 November. Studio Mutt chose the locations for each of the human-scale sculptures to correspond with their individual characters. The Monk is installed in the room known as the Monk's Parlour, while The Lawyer sits in the kitchen overlooking Lincoln's Inn – one of the associations to which London's barristers belong. The Architect resides amongst a series of cast pediments, while The Magician is located down in the Crypt. 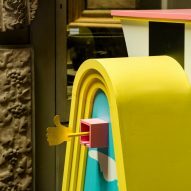 Built by Mike Smith Studio, the installations are made from a combination of sheet material and vibrant coloured vinyl. They are adorned with accents of brass, fossil and foam to demonstrate the "quirks in their personalities". According to the studio, the colours and patterns featured in each of the characters were influenced by Soane's colourful interiors. 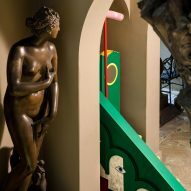 The Magician incorporates a monochrome staircase, while The Lawyer pairs cartoon-style brickwork with rainbow colours. "Too many buildings now default to a watered down, depoliticised modernist rhetoric which sees ornament, colour and character as superfluous elements," said James Crawford, co-founder of Studio Mutt. "Out of Character explores how an architecture of character can communicate and give life to buildings of all scales whilst also questioning how a person's character can inflict on the design or interpretation of a building," he explained. The characters are based on an 1812 text by Soane titled Crude Hints towards a History of my House, where the architect imagined his museum to be inhabited by four figures. "In this strange and perplexing text Soane imagined his home as a ruin centuries in the future, inspected by visitors who speculate on its origins, functions and previous inhabitants," said Crawford. Accompanying the installations are digital illustrations of each character, which are positioned in picture frames across the museum. Established in 1833, the Sir John Soane's Museum is kept exactly as it was when the architect was alive. It features his vast collection of paintings and antiquities, as well as more than 30,000 architectural drawings. 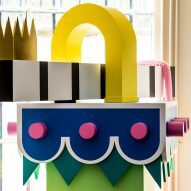 Out of Character was on show at the museum throughout London Design Festival, which took place between 15 and 23 September, but will remain in place until 18 November. This is not the first time Studio Mutt has reinterpreted abstract concepts into physical installations. Previously, the studio transformed icons from Britain's historic Ordnance Survey maps into colourful architectural elements.